The movie Green Inferno: trailer, clips, photos, soundtrack, news and much more! Release date: September 25, 2015. What is the story of Eli Roth’s Green Inferno? To sum up the film it’s just about a bunch of savages who are going to eat a group of (white) civilized-but-naive people, lol! Well, that chap does look the part, look at his teeth! By the way why is it that sharpened teeth and cannibalism often go hand in hand? In theaters: September 25, 2015. Everyday over 80,000 acres of rainforest are destroyed. But there are people who will do anything to protect it. The best way to educate those cannibals is to get rid of them once and for all! comes his most terrifying film ever! There is something really evil about this tribe… God, all those cannibals will burn in hell for sure… Maybe the kids can still be saved… But the local government would have to take them away, because they’d grow bad under the wicked influence of their elders. Anyway, the film will hit theaters on September 5, 2014.
the director of “Hostel” and “Cabin Fever”. Filmed on location in the rainforest of Peru. The setting of this film is definitely gorgeous! But those cannibals are damn creepy! Could McDonald’s open a branch there asap and save their souls with fatty junk food? 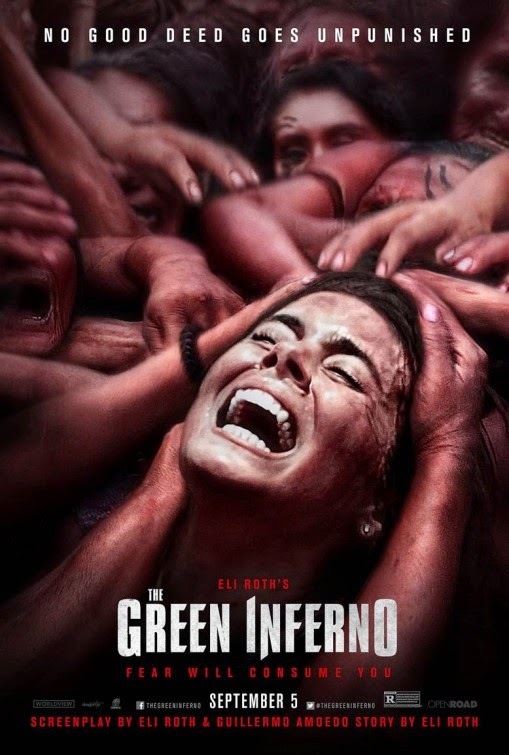 The release date of Green Inferno is set to September 5, 2014. The girl is crying and yelling… Those uncivilized cannibals should know that stress prior to slaughter gives bad meat! Why don’t they try to soothe her? The cast includes Lorenza Izzo , Ariel Levy, Aaron Burns, Daryl Sabara, Kirby Bliss Blanton, Magda Apanowicz, and Sky Ferreria. There’s no official release date.